of their wealth to charity. A native of Brooklyn, New York, Kevin Salwen has flown on Air Force One and on the NASA zero-gravity aircraft called the “vomit comet.” He has thrown out the first ball at a New York Mets game, and most recently was an extra in the Academy Award-winning movie, The Blind Side. Kevin was a reporter, columnist and editor at the Wall Street Journal from 1981 to 2000. At the nation’s largest newspaper, Kevin helped cover two presidential administrations, wrote two columns and launched two publications. Since leaving the paper in 2000, Kevin built several media ventures and works with such organizations as the U.S. Olympic Committee and Yahoo! A graduate of Northwestern University, Kevin serves on the boards of Habitat for Humanity in Atlanta and the East Africa Children’s Education Fund. These days, Kevin and his family spend much of their time and energy encouraging Americans to recognize that they can build more powerful relationships through generosity and service. The story of The Power of Half has been featured in The New York Times, CBS Sunday Morning, ABC World News With Diane Sawyer, The View, People and Oprah magazines and many other media outlets. The Curran Distinguished Mentor program was generously endowed by William Curran ‘49 in memory of his wife, Jane. The program aims to provide students access to role models who embody Dwight Hall’s mission in their professional lives. Past Distinguished Mentors include former Mayor of Baltimore and Dean of Howard University School of Law Kurt Schmoke ‘71, Natural Resources Defense Council (NRDC) President Frances Beinecke ‘71, and former CEO of Proctor & Gamble and co-chair of the National Underground Railroad Freedom Center John E. Pepper, Jr. ‘60. 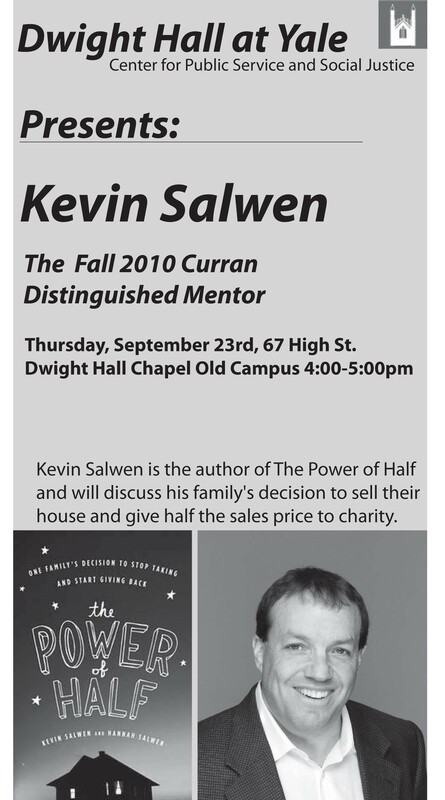 Kevin Salwen, author of The Power of Half, will serve as the Distinguished Mentor on September 23, 2010.